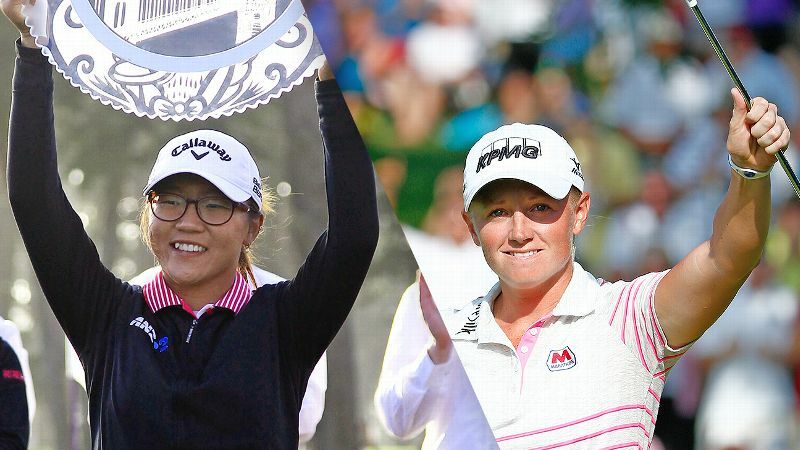 Lydia Ko claimed the richest payday ever in women's golf -- $1.5 million; Stacy Lewis highlighted a stellar year for American players, winning the tour's trifecta of postseason awards. NAPLES, Fla. -- There really was something for everybody this season on the LPGA Tour. If you're a fan of American players, this was one of their best years in quite some time, starting with the success of Stacy Lewis. She became the first American since Betsy King in 1993 to claim the tour's "trifecta," winning the Rolex Player of the Year award, the season money title ($2,539,039) and the Vare Trophy for lowest average score (69.532). Lewis also spent a good portion of 2014 ranked No. 1, although South Korea's Inbee Park has reclaimed that spot and will be there to start the 2015 season. Still, Lewis was mostly happy with her year, save for the fact she didn't win a major. Three other U.S. players did win majors, all of them a part of the Americans' dominance during the first half of this season. Lexi Thompson took the Kraft Nabisco Championship in April, Michelle Wie the U.S. Women's Open in June and Mo Martin the Women's British Open in July. In all, U.S. players won 11 of the first 17 tournaments, a surge they attributed in part to a reaction to the disappointment of losing the 2013 Solheim Cup to Europe. It was a mixed bag for Europe this LPGA season. The top-ranked European player -- Norway's Suzann Pettersen, at No. 4 -- didn't win a tournament. But Sweden's Anna Nordqvist won twice, and Spain took the inaugural International Crown, the tour's newest team competition. Next year, the Solheim Cup will be in Europe, with Germany hosting for the first time. One of the oddest things about 2014 was that no South Korean player won for the first five months. Taking into account that nation's considerable success on the LPGA Tour, that's a long drought. But once the calendar turned to June, the South Koreans heated up, winning 10 tournaments the rest of season. Three of those titles went to Park. If you love big-time underdogs, Martin's British Open victory was your kind of feel-good story. Martin, 31 at the time, had never won an LPGA title before and spent six years playing on the developmental tour. Onetime phenom Michelle Wie finally won her first major, the U.S. Women's Open nonetheless. If you love winners from the oldies-but-goodies category, Australia's Karrie Webb carried the "senior citizen" banner well. Webb, who turns 40 in December, won two titles in 2014. On the opposite end of the age spectrum is New Zealand's Lydia Ko. She turned 17 in April and has already won five LPGA tournaments. Three came this season, including Sunday's CME Group Tour Championship here in Naples at Tiburon Golf Club. That gave Ko the LPGA's richest single payday ever, with $1 million for taking the season points race and $500,000 for the tournament title. The LPGA also had what was perhaps the putt of the year in all of golf: Paula Creamer's 75-footer that went down a ridge in the green and broke sharply left and into the hole, giving her a playoff win in February. That ended a nearly four-year victory drought for Creamer. And Wie's U.S. Women's Open victory was all the more highlighted because it was the onetime phenom's first major, and it was contested on the same Pinehurst No. 2 course that the men had played in their U.S. Open the week before. Now what's in store for 2015? For starters, a new tournament in Florida will launch the season at the end of January in Ocala. And there will be name and sponsor changes for two of the LPGA's major championships. The Kraft Nabisco will now be the ANA Inspiration but will still be held at its longtime location in Rancho Mirage, California, and keep the same late March-early April date. The LPGA Championship will become the KPMG Women's PGA Championship and be held in Westchester, New York. The schedule has filled out and purse sizes have increased under commissioner Mike Whan's tenure. That's meant more tournaments outside of the United States -- again, there will be 15, plus the Solheim Cup -- but that's brought sponsorship money and television rights fees the LPGA needed. Plus, it reflects the constituency of the tour, which is global. So for 2015, expect to see a lot of the same things we saw this year. Which is good news for the LPGA.